While a smartphone or tablet is virtually guaranteed to have an ARM chip inside, that’s no longer the case for Chromebooks, which appear to be swinging in the direction of Intel processors. Case in point: Samsung's new Chromebook 2, announced Friday, which has Intel's Bay Trail M Celeron N2840—not one of Samsung’s own Exynos dual-core ARM chips. Earlier Chromebook 2 versions shipped with ARM processors and will continue to do so, but in a briefing with PCWorld, Samsung product manager David Ng said Chromebooks are quickly trending toward Intel components. "More than 50% of Chromebooks sold these days have Intel processors," Ng said. Samsung knows what it's talking about. Little more than a year ago, Asus, Acer, and Samsung owned the market for Chromebooks, which Google conceived as little more than a Chrome browser running on top of a notebook’s hardware. 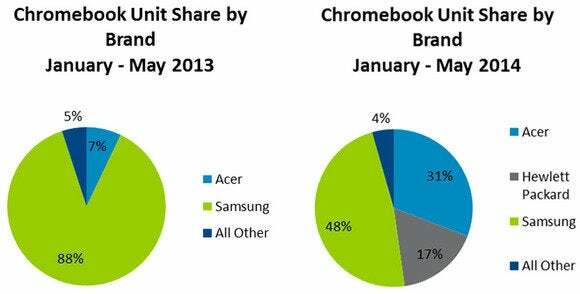 Over time, as computing migrated to the Web, consumers began recognizing the Chromebook as a cheap alternative to PCs. Other hardware makers have joined the Chromebook movement, but Samsung holds the most retail market share by far, according to NPD, giving it a bird's-eye view. 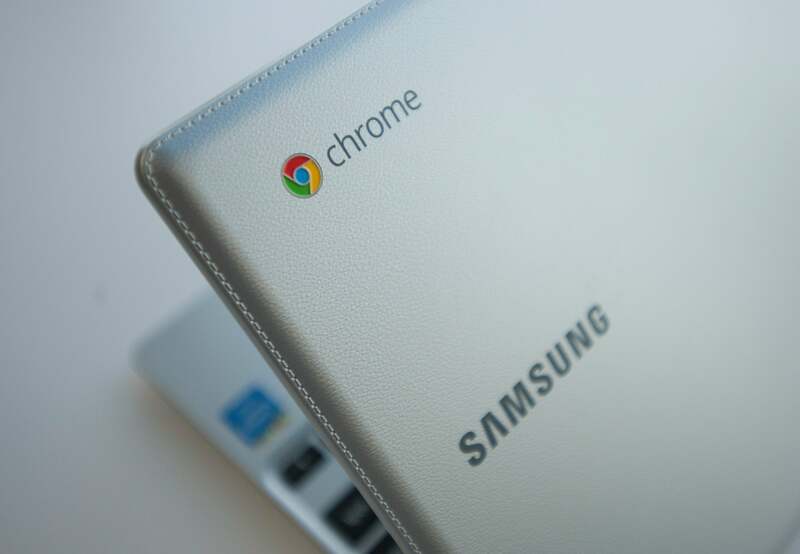 NPD puts Samsung on top of the Chromebook market, at least in retail. Why this matters: As Chromebooks gain stature in the computing world, it’s important for Intel to defend its turf. If hardware vendors sell too many low-cost computers with ARM chips inside, those vendors will start to wonder why they’re paying top dollar for “Intel Inside.” Plus, there’s always the outside chance that a Chromebook will evolve to become something that competes with a Windows RT tablet. It’s about positioning: Intel wants you to equate premium computing with its own processors. 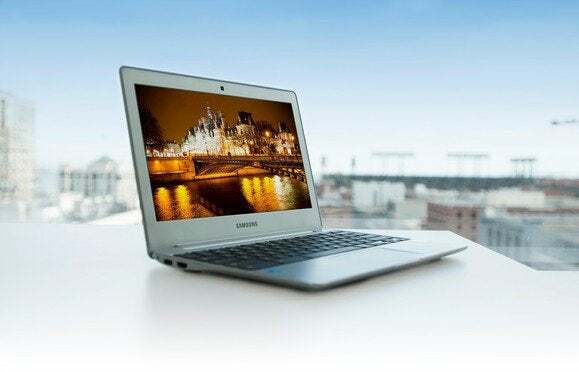 Samsung's Chromebook 2 uses Intel Celeron chips, although the company's chip division manufactures the Exynos processor. Two different analyst firms confirmed that Intel is indeed winning. “I can say that the [Intel] X86 share was close to zero 18 months ago, and the surge happened late in 2013 and it’s been steadily climbing since with no evidence of slowing,” Dean McCarron, an independent analyst tracking component sales, said via email. Although McCarron tracks component sales, not systems, he said his research would allow him to make a “soft” estimate that about 75 percent of all Chromebooks shipped with Intel X86 chips inside as of the third quarter, while the remainder included Samsung Exynos ARM chips. If there’s any race to be run in Chromebooks, it’s between two Intel chips: the Celeron 2955U—which McCarron said accounts for almost two-thirds of the Intel designs—and the “Bay Trail” N2830/N2840 chips, which essentially make up the remainder. A very small number of Chromebooks use the Intel Core i5: the Chromebook Pixel, a $1,200 computing device that Google used to lure developers to the platform. NPD, which tracks retail sales, also reported similar results. Specifically, an NPD spokeswoman said that from Sept. 2013 through August 2014, Chromebooks with Intel chips inside outsold Chromebooks with ARM chips inside more than two to one, with Intel chips commanding 69 percent of the market. Why Intel has succeeded, and ARM has slipped, isn’t exactly clear. In September, however, Intel chief executive Brian Krzanich offered one reason: ubiquity. 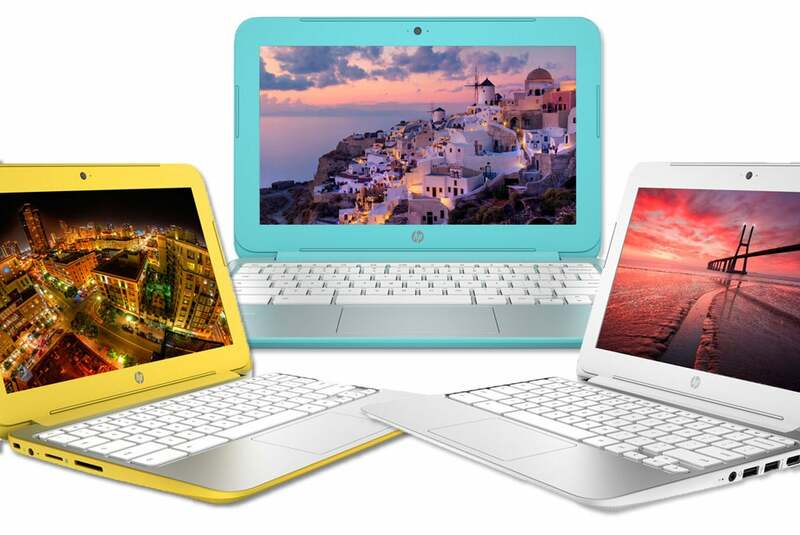 HP's Chromebook 11 models switched from an Exynos ARM processor to Intel's Celeron this fall. Traditionally, ARM’s argument has been similar. But while ARM can run most other operating systems, it can’t run Windows—at least, not the traditional X86-based Windows that is powered by AMD and Intel chips. That doesn’t mean that you should count out ARM completely, though. A spokesman for ARM noted that a year ago, Samsung offered the only ARM-based Chromebook in the market; today, Acer, Hewlett-Packard, and Samsung all offer ARM-based models. ARM has also shipped 64-bit microprocessors into the Samsung Galaxy Note 4 and HTC Nexus 9. “If you look across the Intel-based Chromebooks there is not much OEMs can do to differentiate, whereas using ARM gives them more flexibility to add more memory and bump up the display resolution, which is exactly what Samsung has done,” the ARM spokesman said. With ARM processors becoming virtually synonymous with the smartphone and tablet, ARM's business isn't in any particular danger. Still, powering a Chromebook would be further validation that an ARM-powered device can compete with a traditional PC. And Intel doesn't seem to want to let that happen.